Create structure and discipline to your life! Howlite is an excellent calming stone. It is an antidote to insomnia, calms an overactive mind, creates ambition, and teaches patience. It also helps to eliminate rage, helps to rid of uncontrolled anger, overcomes selfishness, strengthens positive character traits, stills the mind, allows for calm communication, strengthens memory, stimulates desire for knowledge, and calms emotions. Black Onyx will support you in times of physical and mental stress, and helps you foster wise decision making. This stone also provides support in difficult or confusing circumstances, alleviates overwhelming fears and worries. Not only does Black Onyx absorb and transform negative energy, it helps to prevent the drain of personal energy as well. Bloodstone is a grounding stone that banishes evil and negativity, heightens intuition, and increases creativity. Black Obsidian grounds the soul and spiritual forces, manifest spiritual energies, and increases self-control. Release stress and stimulate your enlightenment with Lapis Lazuli. It encourages taking charge of life, reveals inner truth, encourages self-awareness, and promotes self-expression. 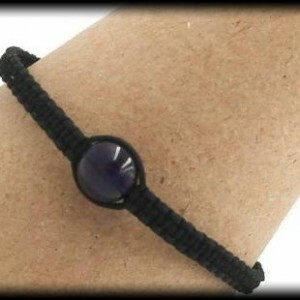 Hematite harmonizes the mind, body and spirit, protects the soul, and dissolves negativity. Pyrite acts as an energy shield. It is an extremely positive stone that stimulates the flow of ideas and blocks negative energy. It aids in boosting self-worth, increases energy, and promotes diplomacy. 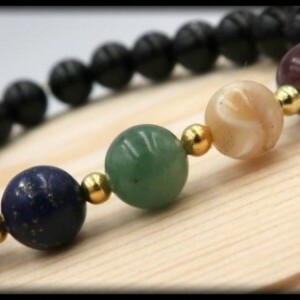 This beneficial bracelet is crafted with 8mm beads of Howlite, Bloodstone, Lapis Lazuli, Black Onyx, Black Obsidian, and Hematite; Pyrite spacers. SIZING INFORMATION Please measure your wrist with a measuring tape to ensure the most accurate measurement. If you do not have a measuring tape, you can also use a string by wrapping it around your wrist and then cutting the piece of string. After you have your cut string, place it alongside a ruler and write down your measurement. To ensure a perfect fit, please had 0.5 inch to your wrist measurement, if you want a little room please add .75 inches to your wrist measurement.